In a small bowl, sprinkle the gelatin over the water and let stand until softened, about 5 minutes. In a small saucepan, bring the heavy cream to a simmer with the chopped peanuts. Let the peanut cream stand off the heat for 15 minutes. Strain the peanut cream into a medium bowl; discard the chopped peanuts. Wipe out the saucepan, add back the cream and bring to a simmer. Off the heat, whisk in the gelatin and chopped white chocolate until melted. Transfer to a bowl and refrigerate the peanut cream until it is set, about 2 hours. In a small saucepan, heat the cream until steaming. Put the milk chocolate and unsweetened chocolate in a medium bowl and add the hot cream. Let stand until melted, then whisk until smooth; let cool. In another small saucepan, combine the sugar and water and bring to a boil, stirring until the sugar is dissolved. In a large bowl, using an electric mixer, beat the egg yolks at high speed until smooth. Slowly pour in the hot sugar syrup while beating at high speed; be careful not to pour the syrup directly onto the beaters. Beat until the mixture is cool, pale and thick, about 5 minutes. Using a rubber spatula, fold in the chocolate mixture until no streaks remain. Cover the mousse with plastic wrap and refrigerate until chilled, about 1 1/2 hours. Line a medium baking sheet with wax paper. In a medium, microwave-safe bowl, melt the peanut butter and chocolate at high power at 30-second intervals, stirring until smooth. Stir in the cornflakes and peanuts and spread the crunch on the baking sheet in a 1/2-inch layer. Freeze until firm, about 1 1/2 hours. Chop into small pieces. 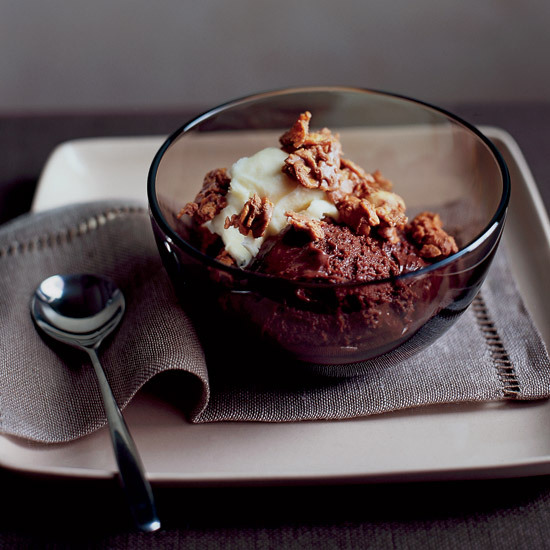 Spoon the mousse into 8 glasses or bowls and top each with a scoop of the peanut cream. Sprinkle with the peanut crunch and serve. The chocolate mousse and peanut cream can be refrigerated for up to 2 days. The peanut crunch can be frozen for up to 5 days.